Reading is one of the main pleasures in my life. Besides Travelhappy, I also edit another website called SpikeMagazine.com, an online magazine about books that’s been around for over a decade now. (My pride in that achievement is only tempered by the fact it makes me feel so goddam old). Being based in Bangkok for the last couple of years has not led to any slowdown in my book consumption, however – Thailand’s capital has numerous English language bookshops which provide an exceptionally wide range of books, both new and secondhand, and imported from both the UK and USA. Book prices in Thailand for English language books tends to be around the same or less than their original domestic price – so if you love reading when you’re travelling, it pays to wait until you get to Thailand rather than bringing stacks of books with you. Around Khao San Road, there are plenty of second hand booksellers, but most of them are pretty savvy as to the original value of the books they sell and therefore don’t reduce the price by much on a secondhand book. It’s not uncommon to find Lonely Planet guidebooks that are several years old for the same price as a brand new, up to date copy! Be sure to check the publication date of any LP guide and also make sure it’s the real thing rather than a photocopied bootleg with poor quality illegible maps and stitching that will fall apart after five minutes travelling. (Bootleg books are a big part of the counterfeiting trade in South East Asia – see my previous article on bootleg books in Cambodia and Vietnam). To my mind, the best bookshop around Khao San Road is Aporia Books, which is located directly at the Burger King end of Khao San – it’s not in Khao San Road itself, but directly opposite, looking into the mouth of Khao San. You can’t miss Aporia’s big yellow sign, and there is an excellent collection of both second hand and brand new books in there. It’s actually quite an intellectual bookshop, with French philosophy (Derrida, Foucault et al) sitting besides the more common South East Asia history books and travel guides. The back of the shop has stacks of quality second hand books, the prices of which vary from tolerable to definite bargains. I visit Aporia every few months and very rarely leave without having found something worthwhile. The other second hand bookstore in Bangkok that is definitely worth visiting is Dasa, which is located between Sukhumvit Soi 24 and 26. It’s easy to get there – get the Skytrain to Phrom Phong station, get out at Exit 4 and keep walking up the main Sukhumvit Road. You’ll soon see Dasa with a table of books outside its shop window. Everything in the shop is secondhand and their prices are very keen. They also sell great coffee and cakes as well as having a regular updated database available on the Dasa website to download and browse if you are hunting a particular title. You can trade in popular books in decent condition too. There is also Elite Used Books, which is in the same area as Dasa, but in the opposite direction. From Phrom Phong Skytrain, go out of Exit 3 and walk down Sukhumvit Road – Elite Used Books is a small store a couple of hundred yards down here. It’s quite difficult to move around in this shop as it’s so small, and the organisation is fairly random, but it’s fun for a nose around. If you can’t find what you want secondhand, there are plenty of well-stocked brand new bookshops in Bangkok. The four key bookshop chains are Asia Books, Kinokuniya, B2S and Bookazine. Kinokuniya is a Japanese owned store that specialise in having very big bookstores in two or three locations, while Asia Books have small outlets scattered all over the city, as does Bookazine which focuses heavily on news and magazines too. B2S has several huge stores in Bangkok’s ritzy shopping malls that combine bookshops with music and DVD sales. In Siam Paragon, one of Bangkok’s biggest and newest shopping malls, you’ll find very large branches of Kinokuniya and Asia Books in which pretty much anything you could want is available. Get off at the Siam Square BTS Skytrain station and walk straight into the mall. Check the mall directory for directions to both bookstores – they are on separate floors. The B2S flagship store in the huge Central World mall (nearest Skytrain station: Chidlom) is also definitely worth a visit, with a large range of left-field titles. If you visit the previously mentioned Dasa, you might want to visit the nearby Emporium department store, which is directly connected to Phrom Phong BTS Skytrain station, as it has branches of Asia Books and Kinokuniya on the 3rd floor. There is also the beautiful Benjasiri Park next door to Emporium, which is like a minature version of New York City’s Central Park, where you can read your new acquisitions while sitting on a bench or the grass by the pond. Sadly only Asia Books and Kinokuniya have information on their store locations in English on their websites – however, as Siam Paragon and The Emporium are both easy to find, it’s not difficult for tourists to stock up on good books when they come to Bangkok. 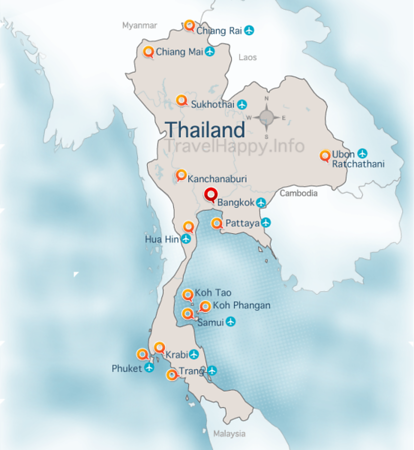 If you want some suggestions about great books about Thailand to buy, check my Thailand books recommendations and also the Travel Books section of Travelhappy.